0 tours are queued for brochure printing. Click here to print brochure. Swathed in 15,000 acres of secluded grassy wilderness at the top of the Córdoba hills, Estancia Sierra Chicas is an idyllic retreat for horsemen, hikers and nature lovers. This working ranch breeds Aberdeen-Angus cattle and Paso Peruano pacing horses. It has been in the Anglo-Argentine Begg family for four generations and offers the possibility of combining the pleasures of British-style estancia life with long-distance riding in one of Argentina's most interesting riding areas. On the distance rides, participants can camp if they wish, but lodging is generally in cozy hostels and local cottages. The main house is steeped in family history with many references to the days of the Jesuits who first organized farming in the area. Fun, fast and exciting, polo is a competitive team sport that combines good horsemanship with tactics and ball skills. Often too expensive or inaccessible to try at home, these polo weeks allow you to try this fabulous game in a truly unique environment, whilst not breaking the bank at the same time. Argentina has the best polo players in the world and so what better place to start? If you have never tried it, we should warn you that polo is highly addictive, and it may be the start of an extremely expensive habit . . . Using the estancia as your base, explore the Sierras Chicas on a trail rides and play polo ‘country-style’. This is an 6,000-acre working farm that has remained in the same Anglo-Argentine family for four generations. The Estancia is very secluded and located on the top of the "Sierras Chicas" at an altitude of 3,000 feet. Nestled between the pampas and the Andes, the Estancia lies the heart of the beautiful region of Cordoba. Steeped in family history, there is much local evidence of the pioneering work of the Jesuits who first organized farming in the area, before they were forced to leave in the 1760's. Here we provide you with the opportunity to get involved with the sport of Polo for a week - Country Polo to be specific. Country Polo is an introduction to polo. It is aimed at the novice or occasional player who would like to improve their Polo skills, but also enjoy varied and interesting rides in fabulous countryside. Who are the polo weeks for? These polo weeks are aimed at the beginner, novice or occasional player who wishes to learn how to play, brush up their skills or just have some fun in an informal and friendly environment. Half-day polo sessions are combined with stunning trail rides out into the estancia on our fabulous horses, so combining two amazing holidays in one! We would like polo to be cheerful and fun, with no pressure or embarrassment, a starter rather than main course. Sierra Chicas Country Polo Clinics offer a fun holiday in beautiful scenery, with excellent horses and all within the context of a real farm environment. This is a place for people who appreciate fine horses and know how to ride. However, there are horses for every ability. Click here for updated current rates. After a hearty breakfast of bacon and eggs, we take the horses down to the polo ground. A short session on the ground covers the skills and tactics that are going to be focused on that day, and then we mount our polo ponies for a short ‘stick and ball’ session, followed by some chukkas. Back to the estancia for lunch, a siesta and maybe a swim in the pool, followed by a sunset ride out into the beautiful Sierras Chicas. A candlelit dinner accompanies the tales of the day, that get longer as the week goes on! The week culminates in an in-house tournament, often joined by players from the local area. We hope to prepare for a mini tournament at the end of the week when local players may visit, or we go to the village and "play away" representing the estancia in the team colors. All of this takes place in a beautiful setting allowing you to explore the hills and a traditional way of life. We provide you with polo gear during your stay, however we strongly recommend that you bring your own boots, gloves and helmet to guarantee a comfortable fit. Our success is that even though accomplished players have their contacts, there is a larger market for riders who have always fancied a "go" at polo. We offer a holiday that far exceeds the average polo estancia - adventure in a beautiful landscape, excellent horses and all within a real country environment. We are not swanky about polo but it would be wrong to underrate our farmers polo. A "country polo" week with an in-house tournament will take place several times a year and guests are welcome. This concentrated week of polo can be arranged at most times of the year with a minimum of four players. Professional polo tuition is also available. The itinerary is flexible and subject to change. *It should be noted that polo is weather dependent. If the ground is too wet to play, an alternative ride will be offered and where possible the sessions will be made up during the week by playing twice per day. This is the land of the gaucho – the great horsemen who have a long, proud tradition and attachment to their horses. The gauchos like their horses to be forward-going and to carry their heads quite high. They train the horses to stop at the lightest touch on the rein and to go anywhere and do any job without hesitation. Jose, one of the gauchos who rode out with us most days, was amazing to watch – he was as happy working cattle as he was leading guests on rides, when often he would quietly break into song. This is a place for people who appreciate fine horses and know how to ride. However, there are horses for every ability, and beginners are welcome. The horses are bred on the estate and used for working the cattle. Some are Pasos Peruanos, others native Argentine Criollos, and the rest crossbreds. All are small, sure-footed and responsive. The Pasos Peruanos are of ancient Peruvian descent, quite different to many Western horses, which often possess some Arab ancestry. The unique quality of the "Peruvians" is that they have the pre-Moorish Spanish paso, an extraordinary gait that enables them to walk at the speed of a canter. The ride is smooth and feels like sitting in a portable armchair, perfectly suited for the distances required of the landscape. It's also ideal for the nervous or beginners. For those accompanying riding partners or friends, there is often the opportunity to join for picnic lunches, and to watch polo being played on the Estancia. Or perhaps enjoy a ride in one of the antique cars or more traditional horse-drawn carriage. Children under 15 years are not permitted on trail rides, unless they are experienced and competent riders, and the party they are traveling with have reserved the ride exclusively. You can expect to ride for between 4 - 6 hours per day, usually with a longer ride in the morning and a shorter ride in the afternoon, or day picnic rides. Rides are split according to ability, and often we will have several rides going out. The maximum number of guests per ride is 6 (plus 2 guides) but more normally it would be 4 or so. We usually play an informal game of polo at least once a week on the estancia for those that would like to learn/take part. After a traditional lunchtime ‘asado’, Sunday afternoons are usually free for guests to relax and to enable horses to take a well-earned rest. We strongly recommend that you wear a hard hat for riding, and it is obligatory for playing polo. We have a limited number available at the estancia, but you may prefer to bring your own to ensure the correct fit and comfort. The Cordoba region of Argentina is well known for its pleasant weather and healthy climate - "siempre de temporada" or "always in season", is the old slogan. In Cordoba the climate can vary but is generally sunny and dry. The annual average temperature is approximately 16° C to 17° C, and can vary throughout the year to between 14 and 15° C. The sun is strong all year round, so hats and good sun protection are recommended! Cordoba's climate is often described as ‘Mediterranean’, even despite the fact its eastern border is 300 miles away from the Atlantic Ocean, and western edge 330 miles from the Pacific Ocean. During the summer season the days are warm and the nights pleasant. However, the rainy season usually is in the summer months. Rain amounts hardly surpass 500 cubic millimeters per year, with rain levels in the north western province hardly exceeding 200 cubic millimeters a year. Strong and windy storms are frequent during the months of summer, along with heavy rains and electric storms. At the beginning of autumn the days are usually hot at noon and during the afternoon. The mornings and the nights cool enough. April is a very dry month and in May the first frosts may appear. The climate of Córdoba during the winter is cool during the day and cold at night, although there are frequent warm days, due to the influence of the Zonda wind. In winter the climate is drier - but never badly cold. The temperatures can be hot and from one day to the next they can go down several degrees, even causing frosts at night. Differences between one day and another of up to 15ºC or 20ºC. Just as a sunny day can end a strong hail storm. The estancia is situated at 1100 metres and therefore weather can sometimes be unpredictable - there is always the possibility of a wet, windy or cold day, and so pack accordingly! In addition, the sun is very strong, so hats and good sun protection are recommended all year round. Hard hat - a limited supply of hard hats are available on the estancia but for comfort, fit and to ensure compliance with safety regulations in your own country we recommend you bring your own. Towels for the room and swimming pool are provided. The estancia generates its own electricity and supports responsible tourism. Therefore, the use of electrical items such as hairdryers and irons may be limited, and are not provided by the estancia. It is possible to do laundry- cold wash only and no ironing (we create our own electricity and so it is very precious to us!). There is no fixed charge – we just ask that guests reflect the washing in their gratuity. Sorry, no video is currently available for this tour. *Important Notice: The following ratings have been submitted by guests and do not necessarily represent the views of Hidden Trails, its partners or employees. Every care is taken to ensure accuracy but Hidden Trails is not liable for any errors or omissions. ** No trip reports found with the tour ID you provided. Accommodation on the farm today has a rustic elegance and is very comfortable providing you with all creature comforts. Many of the estancia buildings are several hundred years old, and have been lovingly restored with traditional materials to reflect the history of the area. One of the original cattle brands and symbols of the area ‘The Bell’, can still be seen etched into the fireplace in the sitting room. Today, the walls echo with the laughter of the fourth generation of the Begg family to live in this beautiful part of the world, but the spirit of the estancia from days gone by still lingers. All rooms are individual and tastefully furnished, and all have their own private bathroom. Antiques abound and cooler winter nights are warmed by log fires and wood-burning stoves. Meals are European in style, varied and delicious with plenty of excursions into local dishes, with the dishes supplemented by our own organically grown vegetables, fruit and free-range eggs. The excellent chef can cater for a range of special dietary requirements. The Estancia has its ‘own label’ Argentine wines to accompany the meals, and various grape varieties make for interesting wine tasting. Meals at the Estancia reflect traditional cuisine, and the working practices of the farm respect the long history of animal breeding in the area. For those interested in Argentine cuisine, the chef is delighted to share and demonstrate knowledge of traditional Argentine dishes from our beautiful farm kitchen, using only fresh ingredients, much of which is provided from the estancia. We can cater for a wide range of dietary requirements, providing we have notice in advance. Please advise Hidden Trails of any special requirements that you may have. A ‘pool with a view’ provides a perfect place to relax, along with hammocks on the verandahs. The estancia has an eclectic range of books in virtually every room for guests to enjoy, and an artists box is provided for the creatively minded. The sierras are a photographer´s delight. There's a beautiful garden at the estancia, which is looked after by a Chilean man who is in his 80s, but does not know how old he actually is. The man has no papers and therefore cannot get a pension – so he is reliant upon the kindness of the Beggs who provide him with a home and income in exchange for his gardening skills. Something that sets this holiday apart from any other trip is that you have the opportunity to learn about another culture, without actually realising that you are doing so. This trip includes and can accommodate special dietary requests. This information is not being updated on a regular basis. Hidden Trails does not take any responsibility for the accuracy of the above information. Please, consult the embassy or consulate for updated info. © 2019 Hidden Trails, Ltd. All rights reserved. Beginner A rider who has limited experience, is unable to post the trot and does not canter. Novice A rider who is capable of mounting and dismounting unassisted, capable of applying basic aids, comfortable and in control at the walk, moderate length posting trots, and short canters. Intermediate A rider who has a firm seat, is confident and in control at all paces (including posting trots, two point canters and gallops), but does not ride regularly. Strong Intermediate An intermediate rider who is currently riding regularly and is comfortable in the saddle for at least 6 hours per day. All of the above, plus an independent seat, soft hands, and capable of handlinga spirited horse in open country. 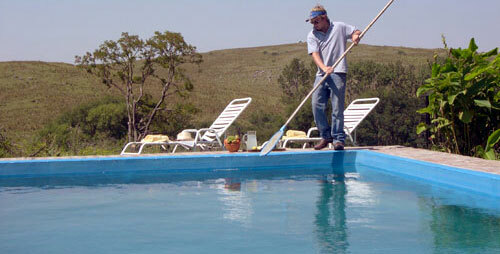 = Facilities in lodges, estancias, haciendas, resorts, etc. Basic lodging - some with shared bathroom facilities, usually no AC or room service. Regular standard room - usually with private bath. = Trips with nights in tent camps. Sometimes the first and last night are in hotels. Basic tent camping - everyone helps out with camp chores. Regular standard with some camp amenities and camp cook. Camping facilities with superior comforts like camp shower, bathroom facility..
= Trips that combine nights in hotels and camping. Basic accommodation and basic camping facilities can be expected. Regular standard with some nicer amenities. Only assigned to hotel and camping facilities with superior comforts.